The magazine’s series of sponsored e-books continues with a look at different aspects of steel design and construction. Resilient channel has been on the market for more than 50 years, but it seems not everyone has a clear idea of when it can be used to solve sound transmission issues in wall and floor/ceiling assemblies. According to one consultant who has worked in engineering acoustics for more than 20 years, the most common question he receives regarding those assemblies is whether they can just be replaced with a layer of gypsum wallboard. It is crucial to identify which conditions warrant the use of resilient channel. If, for example, adding a layer of gypsum wallboard to the assembly would indeed accomplish the same task with equal success, the situation is not one where it is practical to use this product. Building professionals’ understanding of which conditions are appropriate for use of resilient channel can be enhanced by a review of the improvements achievable with its implementation. It is also essential to identify wall types commonly used for residential, education, and commercial construction, and to determine whether the product should be used with each type. 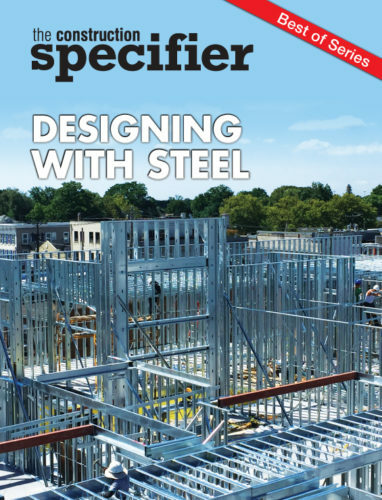 Part of the newest in a series of free, downloadable e-books, a recent article from the pages of The Construction Specifier provides a review of the improvements that can be achieved by using resilient channel, as well as identifying wall types in common construction practice for residential, education, and commercial applications and determining whether resilient channel should be used. To get your copy of “Designing with Steel,” visit https://www.constructionspecifier.com/ebook/marinoware-designing-with-steel-e-book.